Cox Developments is planning to restore the McCall Funeral Chapel and build an adjacent 15 storey chapel. The location is Vancouver and Johnson Streets. Edited by Kapten Kapsell, 15 October 2018 - 12:05 PM. There are a total of 93 rental units proposed including some large two bedroom units of approximately 900 square feet and 3 3-bed units. The restored chapel will be commercial space and there will be coworking space on site too. Ok good! I've been waiting for this report to surface! I believe that this Cox proposal is the first building in Victoria designed by AVRP architecture. Those are rentals? Even that top floor one? Wow. Thanks for the heads-up, Kapten! 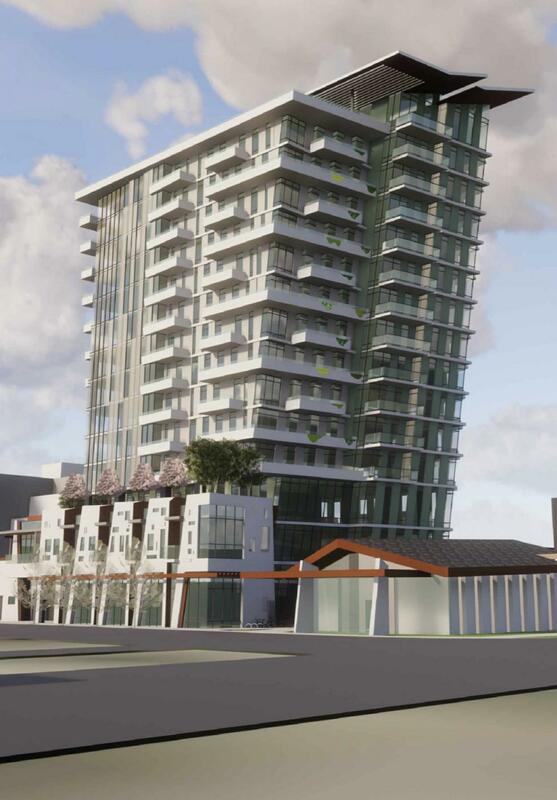 An artist's sketch of 1400 Vancouver Street, a 15-storey residential tower proposed for the 900-block of Johnson Street at Vancouver Street. The building's unique angled eastern frontage will serve as its most iconic architectural element. 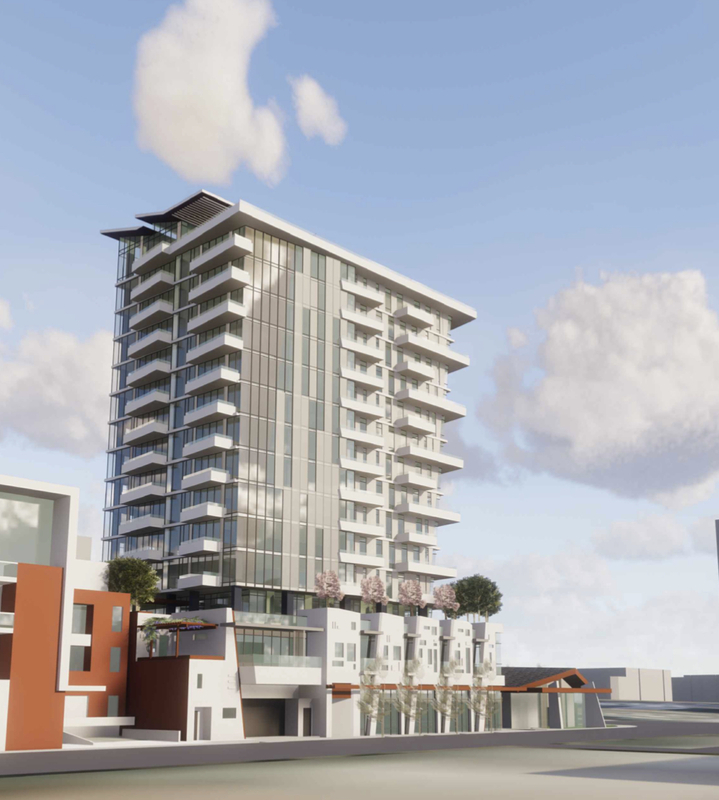 Victoria-based Cox Developments has submitted a proposal to the City of Victoria with plans to build one of the most architecturally unique residential towers in the Capital Region, Citified has learned. 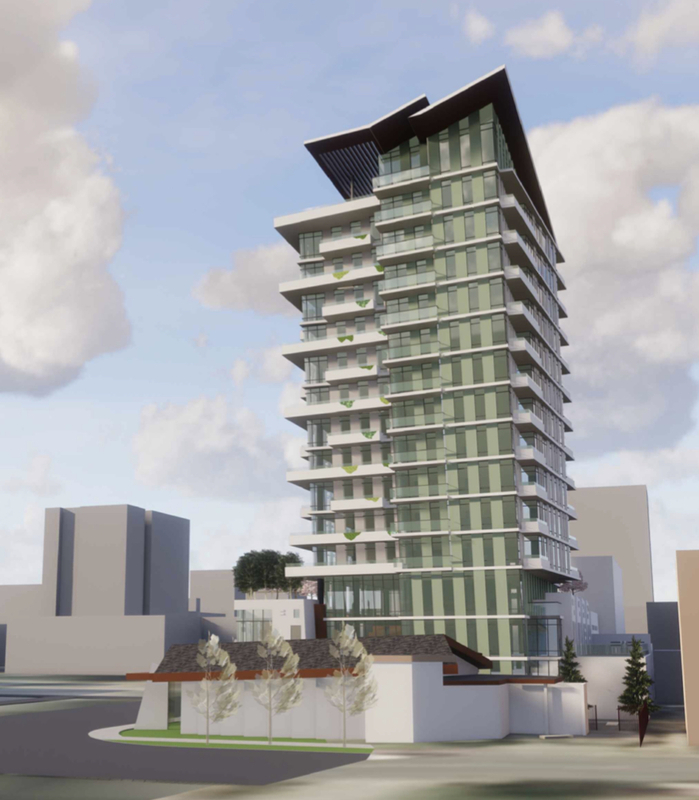 The angled 15-storey design –leaning to the east from its footprint on land formerly occupied by the McCall Brothers Funeral Home along the 900-block of Johnson Street at 1400 Vancouver Street – will be an architectural first for Victoria where a building as prominent as the 50-metre tall highrise will literally hover over its foundation and an adjacent 1960’s-era funeral chapel designed by famed Victoria architect John Di Castri. That is cool and so glad they are keeping the chapel!! Wasn't sure what to make of it initially on first blush but I've decided I like it. A lot actually. It's different with equal parts panache and verve tossed into the mix. Very 21st century. Which no doubt is exactly why the city will likely give it a hard time, heh....not in keeping with the "real Victoria", whatever the hell that is. Really, really hope this one gets done. I also wonder if the chapel is really worth preserving. when its removal could allow a larger development next door. 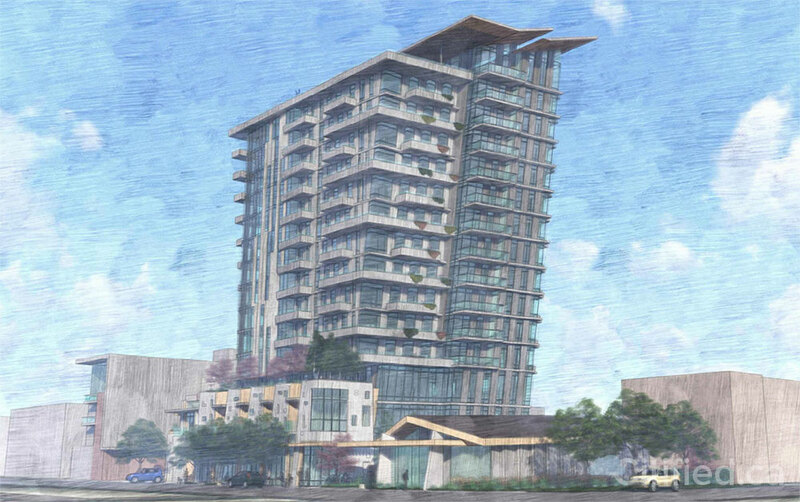 I do like the look of the proposed development - the "leaning" design would be an interesting design feature for downtown. Preserving at least a part of the Di Castri building is the only chance anything has of getting approved for this site. My guess is that this proposal will still have a fight ahead of it from some likely-to-be-re-elected council members, even if it doesn't necessarily block their view of the Sooke Hills. Whether you think his work is worth preserving or not, Di Castri is considered a god in the local architectural vernacular. Can you please elaborate? What exactly is wrong with this proposal? Not enough red brick? Insufficient use of river rock? IMHO, it's weakest aspect is the blank wall that remains along Vancouver Street from the preservation of the chapel, but if that's what it takes to get an eye-catching piece of contemporary architecture built near my 'hood, then I am OK with that. "I've got eleven terrible architectural concepts and two decent ones." Why that's a baker's dozen my son, let's combine them all in one building and call it the Victoria Baguette - which rhymes with bag of shet. As of today N Parker is officially banned from ever whining about spandrel again. ...As of today N Parker is officially banned from ever whining about spandrel again. The use of spandrel has been much more inventively and appropriately used in this proposal, and doesn't appear as a cheap after thought as it does at Encore. Used in the correct context spandrel will not get my hackles up. You've got to 11:59 pm NP.. get it all out! This just might be voted worst proposal of the year if anyone dared to share at SSP Canada in their proposal thread. If aastra comes out in favour - end times are near my friends.